Prime Minister Narendra Modi Tuesday announced 1.25 lakh crore for the progression in Bihar. The proclamation was made while he was in Arrah, Bihar, to lay the foundation of national highway project. The highway project inaugurated by Modi costs 9,700 crores. The project consists of 10 roads which include a 4-lane road from Buxar to Patna and 6-lane bridge in Koelwar, Arrah. Besides, Modi launched 23 skill training centers and declared 40,000 crores for infrastructure development in Bihar. His speech emphasized on the development in Eastern India and how the state’s ruling political party was not making adequate use of funds for the benefit of the people in Bihar. 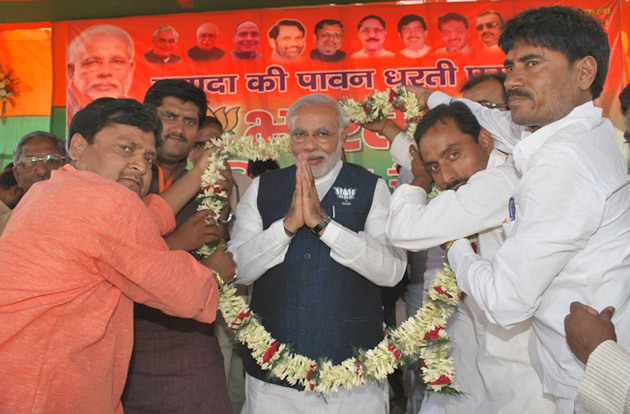 This is Modi’s third rally in Bihar, two months prior the state’s assembly elections. Indeed, such a huge package wasn’t expected either by the people of the state or Bihar’s chief minister Nitish Kumar. During the course of his nearly hour-long speech, Narendra Modi highlighted issues that are a concern of the state. It included the surge in the number of riots in the state from 866 in January 2015 to 1,500 in June 2015 and escalation of severe crime from 13,808 in January 2015 to 18,505 in the past six months. Modi explained that Bihar’s current need is a strong government that can maintain state’s law and order, protect common mans’ life and ensure state’s development. Moreover, what fueled the situation was Nitish Kumar’s absence during the entire program. Though he met Modi on his arrival at the Bihar airport, he didn’t attend the ceremony and sent his cabinet minister Rajiv Ranjan Singh. Modi also took a dig at Nitish on his absence and blamed Congress for no developments. He stated that out of 12,000 crores sanctioned for Bihar, Congress utilized only 4,000 crores. NCML and Adani form an Alliance to Solve India’s Supply Chain Problem.